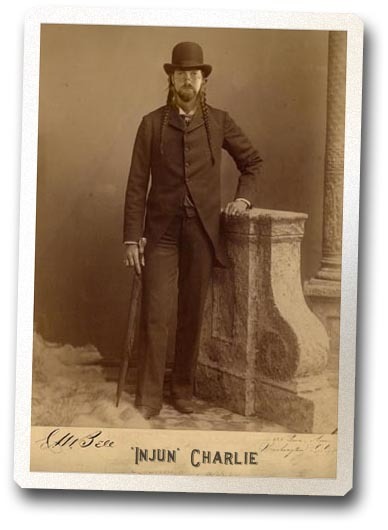 Top News: Suomalainen sukututkija Injun Charlien jäljillä! Lot of stories and legends are told about him, and quite a few historical references still exist but the whole truth may still remain untold. Little is known of Injun Charlies’ early life except that he was an extremely dangerous man, was a crack shot with rifle and pistol and that he knew the ins and outs of knife fighting. He killed his first man at age 22, a French-Canadian trapper named Antoine Primeau, who simply picked on the wrong person at the wrong time. His father was Luis Definn (Dauphin), a fur trader and a guide. His Mother is unknown French desendent. His grandfather Lewis Definn is wellknow soldier and hunter. At 1860, when Charlie was only 13 year old he worked for Pony Express as a rider. 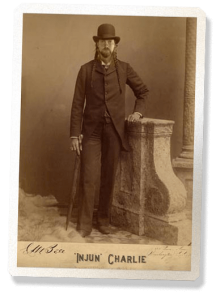 During the Civil War Charlie was adopted by indians. Most probably Charlie and his father were hiding the draft among the Cheyenne indians. Charlie was what was known in those days as a “Squaw-man”. He was taken into the Cheyenne tribe but he later married into the Lakota tribe when he took Tasunke Topa Win, a Daughter of an chief as his wife. He considered himself a Lakota but he kept his White name, Charlie Definn. He was also resourceful, had an eye for horse flesh and was possibly the shrewdest trader on the prairies at the time. He was an adherent of the law as interpreted by the heavy caliber “law firm” of Colt, Winchester, Sharps and Henry, his rifles of preference. Charlie moved about in indians easily but his father insisted young Charlie be educated as much as possible in the white man’s ways. Luis also taught Charlie the tricks of successful trading. As a result the youngster learned how to react with red children, learned their games and learned their strengths and weaknesses. All his life he was never far from “the white man’s lodge” although he preferred to be with Indians whenever possible. While Charlie abhorred whiskey runners and the “firewater” they supplied to Indians he had no such hatred for good whiskey. While he preferred good rye he could stomach the runners’ product and anything else that contained alcohol including red ink and Jamaican Ginger, a particularly potent brew much favored in the west. He was also partial to a potent patent medicine named Peter Parker’s Pain Killer that was widely advertised as capable of curing everything from tuberculosis to snakebite. His drunken exploits would fill several books. During 1870’s Charlie worked for a while as an Cowboy,participating The first Drive through Chiholm Trail. Later on he worked as an buffalo runner, and it has been rumored that Buffalo Bill himself have borrowed some of Charlie’s Buffalo Hunting stories, of course he in the mainrole. Charlie became a minor chief of oglala nation when he was perhaps 25 in recognition of his bravery in battle, his unquestioned leadership abilities and his knowledge of the prairies. It is said he knew every trail from Fort Edmonton to the lands of the Cheyenne and Apache and every hill between those trails. He could find game when all others had returned to camp empty-handed. He spent much of his time in what is now South Dakota, guiding, trading horses and of course drinking. Although Charlie never learned to read or write he could sign his name and was able to recognize it whenever someone pointed it out as he was often mentioned in news items printed in the Helena Herald and other territory newspapers. He would have someone read him the article. But, illiterate though he may have been he could speak several languages. He was fluent in English, Sioux and Cheyenne, had a better than average ability in Cree (which he would speak only when necessary), and was passable in Crow, Assiniboine and Algonquin. For all his ability to get along with white men Charlie was very much an Indian. He never fully understood the white man’s reasoning. For instance, he could never understand the reason that white settlers equipped their houses with chamber pots. “Why,” he once asked a Mountie, “would anyone piss in a perfectly good eating bowl when the entire prairie lay before him”? Charlie wore his “magic” talisman next to his body at all times and hung his captured scalps on the lodge pole of his main teepee in Indian fashion. Still, he wore the clothing of the white man most of the time including a fashionable hat that sported a wide headband. His bushy, drooping mustache was as stylish as that of any white man. From a distance the stocky, bow-legged Charlie looked like a white trapper in his buckskin clothing, his High Hat at a jaunty angle upon his head. Two .45 pistols hung from his gun belt complimenting the Wincester rifle which never left his side. Under his jacket he always kept two smaller-bore pistols. On his leg was strapped a long-bladed skinning knife. He always kept a small gun inside a hide-away pocket, a practice that saved his life on several occasions. By the time Charlie was 35 he had killed at least that many men, mostly whiskey runners, a few Indians who had crossed him plus several Wolfers who had either harmed the Indian population in general or his own family members in particular. Wolfers were white hunters who shot wolves in much the same manner as the earlier buffalo hunters had killed the buffalo. The Wolfers, however, were despised by both Indians (whom they exploited mercilessly) and white men who considered them several notches below the bounty hunters who passed through from time to time. It was a gang of thirteen wolfers who massacred a band of Assiniboine old men, women and children in the Cypress Hills on 01 June, 1873. The reason? A roving gang of Indians had stolen some of the Wolfers’ horses. They couldn’t find the thieves so they slaughtered the first group of Indians they came across. Charlie, despite his love of whiskey, had no love whatsoever for whiskey traders whom he hunted without mercy. When a relative was murdered in 1873 by a whiskey runner from Montana he hunted the man down. Cornering him on the main street of Fort Benton (Montana) he killed him in a face-to-face shootout. The man died from a single pistol shot directly through the right eye. He had managed to draw his weapon but had not gotten away a shot. Charlie always received more salary than any other guide/interpreter because as a guide he had no equal. It was as an interpreter that he fell short although he spoke all the Indian languages of the prairies. He could also speak passable Crow – if he felt like it. His weakness in interpretation lay in his habit of relaying the speaker’s message in the fewest words possible. He would never speak a complete sentence if two words would suffice. At meetings between NWMP officials and Indian chiefs he would listen intently then, following each speech, would condense what had been said into one or two short sentences. Thanks to Tom of Finland, for permission to republish the Injun Charlie’s story.